Click on pictures to see more knife options, prices and to order online. Please allow 2-3 weeks for delivery. All knives are built to order. A right handed sheath sits on the left hip for a right handed cross draw. A left handed sheath sits on the right hip for a left handed cross draw. If right handed you will need a left handed sheath. If left handed you will need a right handed sheath. The High Country sits on your belt at a 45 degree angle and is usually carried as a cross draw. It can be m​ade with a right handed or a left handed sheath. This is a great all around knife for any outdoorsman. Whether a rancher, working cowboy, trail rider, hunter, fisherman, or just like the outdoors this is the one for you. The knife has a 3" blade and overall length of 7". ​ The Little Mesa is like the High Country, just a little smaller. It sits on your belt at a 45 degree angle and is usually carried as a cross draw. 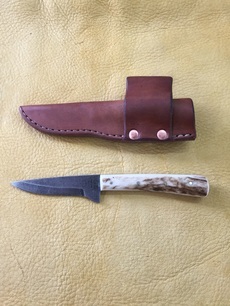 It can be made with a right or a left handed sheath. A right handed sheath sits on the left hip for a right handed cross draw. A left handed sheath sits on the right hip for a left handed cross draw. This is a great all around knife for any outdoorsman. Whether a rancher, working cowboy, trail rider, hunter, fisherman, or just like the outdoors this is the one for you. The knife has a 2 1/2" blade and overall length of 6 1/2". here is the tool that will trim your herd into top notch condition! The knife has a 2 1/2" blade and overall length of 6 1/2". your belt at a 45 degree angle and is usually carried as a cross draw. or just like the outdoors this is the one for you. The Timberline is another great handmade knife. ​a 45 degree angle. Very comfortable to wear with easy accessibility. This is another great blade design for the hunter or outdoorsman. The handle is 3 1/4" long, longer than the High Country and the blade length is 3" long. The overall length of the knife is 7". The sheath can be made left handed for those that need it or because of the way you carry it (center of your back right hand draw). designed to hold the knife in place so it should not fall out. It's my favorite knife to carry and fits on your belt nicely. It's always out of the way and you can get in and out of your pocket easily. caping knife for hunters and it is also great for cleaning fish. with a spring clip built in. It will stay where you put it and not move around. 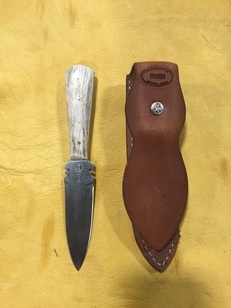 The handle is 3 1/4" long and the blade length is 3" long. The overall length of the knife is 7". ​ Each one is unique in size and color. ​ Survival tool, sharpener & fire starter.